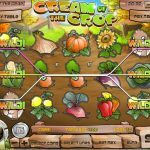 Cream Of The Crop is a cute little slots game by Rival released in 2013 but still very relevant, especially if you love agriculture. This game will really make you appreciate the hard work these guys are doing and the way the food on your plate makes to get there. It might not make you go outside, pull up your sleeves and work the land but… it might get you some cash… Not bad right? 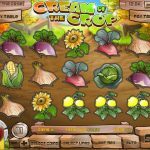 This is a classic 5 reels slot game and each spin will get you plucking cool vegetables out in the countryside. But that’s not all because you get to watch the whole cycle. From planting the seeds in the ground, watching them grow and plucking them in the end. The bonus round is triggered when you land the Treasure Chest symbol. You are then taken to an alternative screen which takes place in the ground where all the other symbols would be. You’re suppose to collect free spins and coins. Unveiling a vegetable will get you 10 to 100 coins and a Treasure Chest will get you 500 coins. Also, every click will earn you a free spin and the bonus round ends when you find the Weed symbol. The good news is that there’s only one such symbol on the screen so you should be very unlucky if you unveil it right in the beginning. 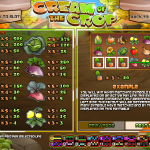 Cream Of The Crop is a very generous game. It’s true, there’s only one Bonus Round which makes the game very simple and not so complex. On the flip side however it is pretty easy to find the Treasure Chest symbol and the bonus round itself is very generous so if you’re not opposed to earning some cash or if you’re a begginer slots gamer then this is definitely the game for you! Prefer history themed slots? Try going to ancient Greece and play Coins Of Olympus a 5 reel slot by Rival.